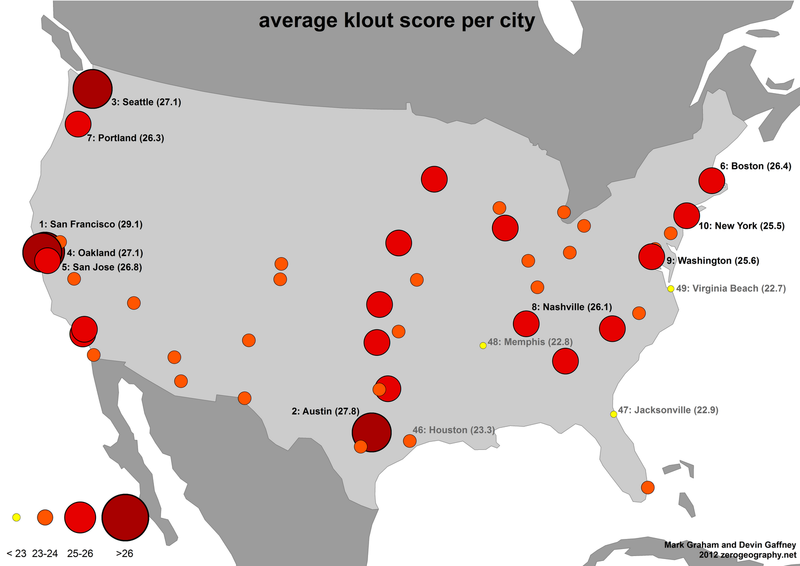 Most Twitter users have heard of Klout scores. These scores which fall between 0 and 100 supposedly measure influence (higher scores indicating that a person is more influential). This isn’t to say that such quantification of a person’s influence based on online activity is entirely unproblematic. The entire endeavour is worrying on a number of levels, and it is highly unlikely that a single number (especially a number generated using Klout’s methods) could ever sum up the various ways in which influence is perceived and enacted. Over the course of four consecutive days of polling for 30 seconds every 5 minutes from Twitter’s spritzer-level of access, we collected a total of 3,598,060 geotagged tweets via the random public timeline. These geotagged tweets were then bundled into their respective countries of origin, and the resulting set of country-bundled tweets were sampled randomly for up to 1000 users. 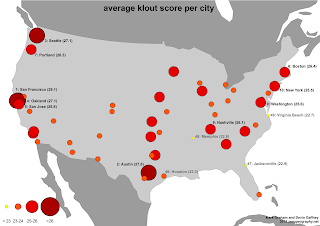 The resulting sample of users were queried using Klout’s API. 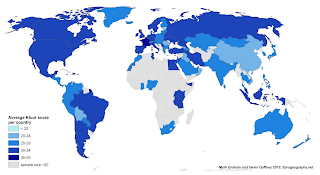 The map above shows only countries with a user sample size of more than fifty users (who publish geotagged tweets). Looking at the data, we see a very interesting amount of variation. The average score, globally, is just 26. France has the highest score with an average of 37.8 (taken from a sample of 837 users in the country). The UK (34.9), Sweden (34.8), Brasil (34.8), and Indonesia (34.2) all follow closely behind (Brazil and Indonesia are incidentally some of the world’s most prolific tweeters). The US, which normally excels in all metrics of online visibility/power/reach comes in at 10th with an average Klout score of 33. This isn’t to say that tweets emanating from the US as a whole are not influential. The US is the world’s largest source of content on Twitter. This massive amount of information, pushed through the platform, undoubtedly means that American users in the aggregate have a large amount of visibility. Yet it remains that they have a relatively weak average ‘influence.’ Nonetheless, despite the strong scores of Brasil and Indonesia, it remains that we (perhaps unsurprisingly) see that most countries in the Global South have less 'influence’ than their Northern counterparts. In the list of top-20 Klout scores, there are only two countries with a GDP per capita below the world average (Indonesia and Egypt). Kenya scores highest in Sub-Saharan Africa (in 22nd place globally) with an average Klout score of 31. Most other Sub-Saharan nations are then much lower down in the list of average influence. This doesn’t mean that there is a clear relationship between GDP (or level of 'development’) and Klout scores (Australia, for instance, is in 52nd position on our list). However, with a few exceptions, poor countries tend to have relatively low scores. Is this because we are picking up traces of the cultural dominance of the North even in a supposedly decentralised network? (i.e. Northern tweeters might tend of have greater reach and amplification than their Southern counterparts) This finding doesn’t mean much for any particular person attempting to communicate or spread a message, but still potentially sheds light on the issue of voice in the world’s margins. On the other hand, perhaps we are just reproducing and amplifying opaque and highly problematic data. We should therefore certainly not overreach in any interpretations of these data. Nonetheless, I still want to know if the French truly are more influential on Twitter than everyone else? And, if so, why?